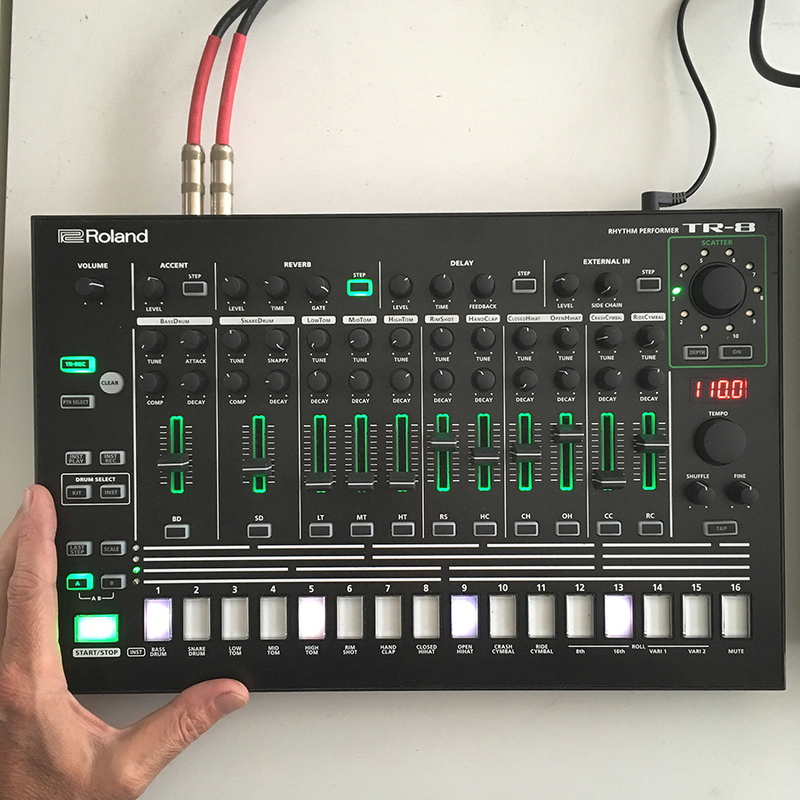 I finally got my hands on the TR-09 thanks to one Mr. Robert Pointer on a recent visit to Los Angeles and this morning, fresh from a road trip out to the Mojave desert, I set it up and began to explore. My first question was how will this be any different from the TR-8? The short answer is that it isn’t really all that different. • The TR-8 has reverb and delay – the TR-09 does not. • The TR-8 can be used to clock external devices (route the rim shot out to an secondary output, program a pattern and go). 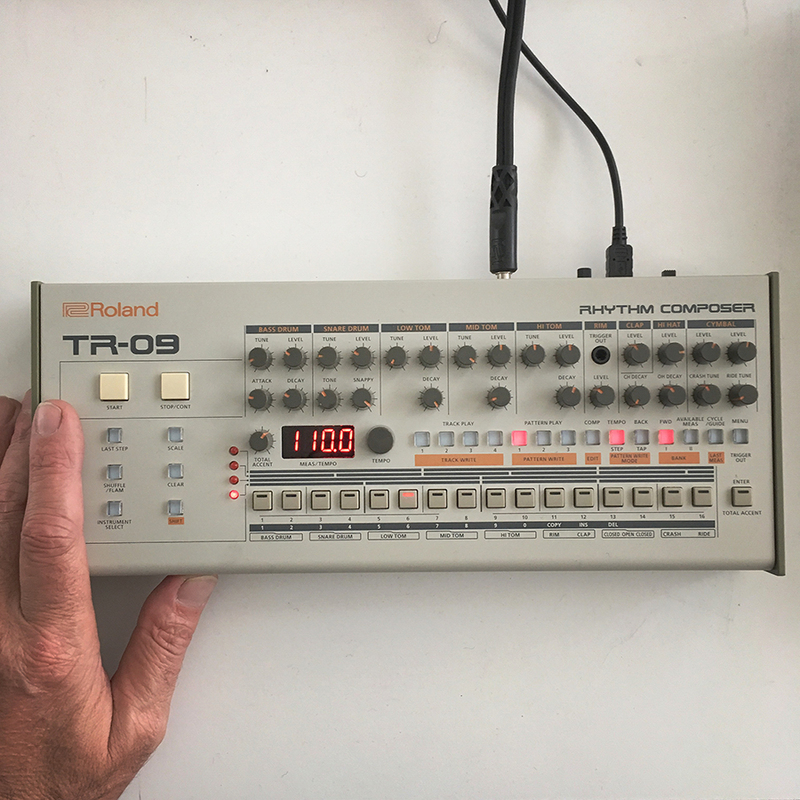 • The TR-8 is ugly – The TR-09 is pretty! For the most part I am assuming that most people will look at these pictures and click on the play buttons and never actually read down here – Who cares what I think, right? – so I feel pretty free to write, and explore and express my experiences and opinions without needing the feel guarded. I was obsessed with how this thing looked and often when I love how something looks I overlook how it works and sounds. At times I have been known to feel absolutely sure that something sounds “better” because of how it looks. When proven wrong, sometimes I relent, other times I just refuse. Aesthetics are important to me, and I think in a way they are to everyone. I programmed the exact same pattern into each of them using what is presented as the exact same sounds with access to the exact same controls (level, tune, decay) and listened to the results. In my opinion Roland have finally begun to do what I decided was the only thing for them to do more than ten years ago – re release modern versions of their masterpieces. So many electronic musicians have grown jaded and discouraged by Roland’s decades of re branding things to resemble their former champions of electronic music – The TR-909, TB-303, TR-808, Juno-6, 60, and 106, Jupiter 8, Jupiter 4. These SP-808’s and Jupiter-80’s may have been interesting to those who are inexperienced, uninitiated, or unconcerned with the great history of electronic music, and the masterful tools used to accomplish some of the most important music of the 20th century, but for those who know, and care, we have been insulted, and disappointed in the toys which have seemed to contribute to the toilet flushing of the electronic arts. As the world moved to the computer, tablet and telephone to replace virtually everything, the synthesizer, drum machine, vocoder, and sequencer have been no exceptions. But at last Roland have begun again to introduce arguably authentic and affordable devices back into the hands of aspiring musicians which appear to be serious tools. Serious enough to bring to a venue and execute a quality performance, with excellent sounding results. More devices have come out since then, and last year the Roland Boutique line was announced and then early this year finally released. This line is miniature reproductions of classic Roland devices. The first round presented the JP-08 (a decent, but ultimately bungled micro version of the classic Jupiter 8 synthesizer,) the JU-06 (a very successful and great sounding reproduction of the Juno 106,) and the JX-03 (also an excellent reproduction of the JX-3P synthesizer.) These each are equipped with minimal step sequencers, delay and chorus, and can be chained either together, or connected to another unit to produce 8 voice polyphony (alone they are 4 voice poly synths.) They are mono, but they sound best connected using balanced, stereo 3.5mm to 1/4″ connectors. They can be chained together via audio input, or sub mixed separately. The only hassle of the audio chain is handling the master volumes of each, as the main volume knob for the Boutique line is on the back, and is difficult to address during a performance. I own them all, and brought them with me on this year’s live ground tour and presented them along with the TR-8 as modern, affordable, and quality examples of devices which anyone can buy, learn, and use for not just the basics of synthesis and drum programming, but also to perform a serious live electronic performance. Now, almost a year later, the Aira division of Roland have introduced a new DJ mixer, a special mixer/sort of sequencer for the Aira boxes, they’re expanded into Eurorack and with the help of the mighty Malekko re invented the magnificent System 500 Modular synthesizer, introduced fairly cumbersome, but extremely useful modular effects, and more… The Boutique line is right behind Aira with the new TR-09 Rhythm Composer, TB-03 Computer Controlled Baseline, and VP-03 Vocoder/String Machine and these are every bit as inspiring to me as the previous reproductions were. Lovely, lovely, small, functional, and great sounding. Fun and at a cost which most people can actually reach for and accomplish. I am delighted and so proud of Roland. I continue to insist that these are inspirational times to be an electronic musician, and these reproductions are only fuel for my fires. Honestly at first I needed to leave the room and think about this. The question of which TR-909 reproduction sounds best? is an absurdist’s paradox. I’m listening to replica, sample, software approximation of a mostly analog device and asking what sounds best. What sounds best is a TR-909. Duh… but ultimately that’s not really the point of this experiment. It was not an effort to see what sounds more like a 909. It was more a curious exploration of what sounds good, and what sounds bad. The big loser is the Drumazon. In little laptop speakers, or carefully tweeked in headphones this plugin is a good one, and sounds great. But in the comparison here it’s no contest. It’s out of the discussion. 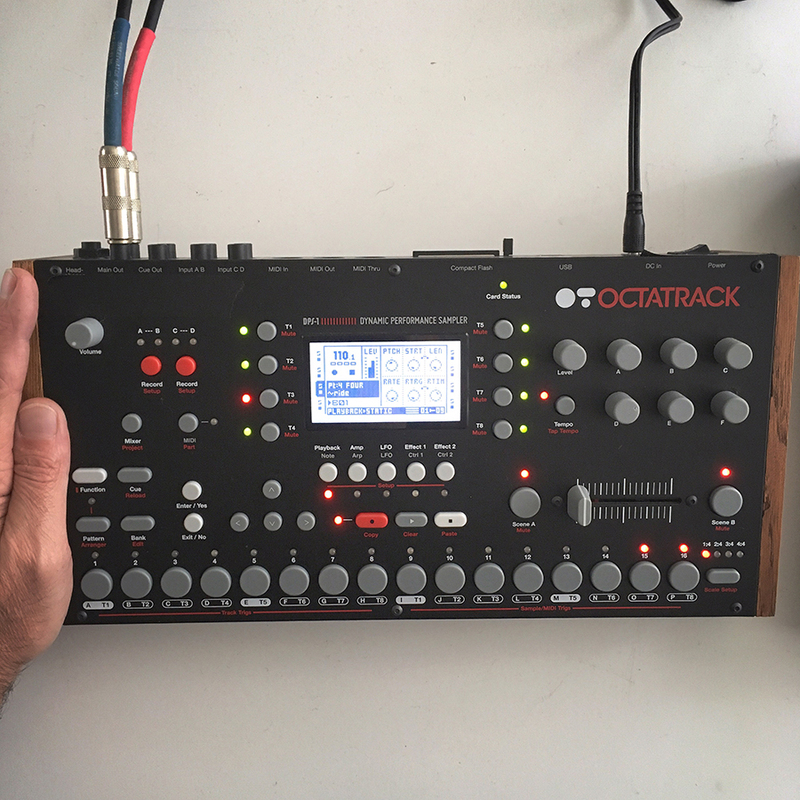 The Octatrack sounds fantastic, granted these are samples I took personally from my own TR-909, set up the way I like it, so naturally I’m going to really love that, but let me discuss something important: Samplers are samplers. They replay recordings as their VCO and while it’s fun to filter, pan, and modulate these things, it will never really be a drum machine. There’s something about the way a single device plays it’s sounds, and these sounds layer, and relate to one another within a machine that a sampler can’t do. It can be sampled, it’s true, but in the end that implies that each experience will then be sampled, and reproduced elsewhere without variation or surprise. That just isn’t as interesting or inspiring to me as the ability to improvise, change, and rework things on the fly during a performance, so looping myself is a passing fancy. So we are back to the limits of what a sampling drum machine can accomplish. I sort of wish I had Elektron’s Analog Rytm to use in this comparison as well, but then I’d have needed to add the Bastl GranPa and the Erica Synths Pico Drum and I’d never get anything done here would I? The TR-8 still sounds good to me, I absolutely love the immediacy of it. But in comparison to the TR-09 there’s something mushy about it. It’s vague, and unscientific, but for me there’s just a little something wrong. This troubled me, so I invited Martha into the studio and blindfolded her. She listened and immediately opted out of the Octatrack and the Drumazon, didn’t like them. So between the TR-8 and the TR-09 she chose the TR-09 every single time. I tried very hard to trick her into liking the TR-8 better (as Martha is an advocate of the TR-8 and likes it a lot, and is always in favor of my keeping it, and using it live, and never gets excited about any other drum machine) but in this instance, she chose the TR-09 every time. So there’s my experience and my opinion in depth. Listen for yourself. Decide what works best for you. I am going to hold onto this TR-09 for a little while, play a few shows with it, and I’ll report back if something changes. But for now, I think it’s a beautiful little replica of the TR-909 and it sounds dope. Get one. Join me. Make music and play live! I love your perspective on the different boxes and history. I like the tr-09 too. My giant hands are afraid. Lovely and insightful read. Thanks s! Neat comparison! I got myself a tr-8 not long after seeing it up close in your live ground tour seminar. It sure is blinding, but other than that, the spacious interface is great. I’m curious what you think of the TB-03, compared to other clones…. @Owen – I’m so glad the seminar helped you choose a machine and get going! Makes me so happy. That’s why I do them. On the TB-03: As soon as I get my hands on a TB-03 I will gladly oblige. Awesome bro. Thank you very much. Been looking for some new gear so def thinking about giving the Roland series a try! Have a maschine studio but use it more for inspiration than playing live. Can get really complicated quickly but def fun! Talk soon. Hope all is well! Good review. Overall absolutely agree with your assessment – except on the TB-3! I love that thing and actually find the UI great for live gigging Not to mention the sound! I’m curious what you think of the MX-1. I love it and think it’s a real game changer from Roland – especially for live sets. I don’t think it quite got its proper respect or due – at least yet. I’ve seen a lot of people using the MX for sequencing, and performance. I think for the Aira and other new devices you’re absolutely right. Step sequencing your effect and mix within a digital audio path is indeed a revolutionary concept that’s pretty cool. As I said above I loved how the TB3 sounded, but live I didn’t enjoy the touch screen. My slippery fingers, plus the very important ENV control just didn’t get along in the dark. I swapped it out for the Bass Bot TT-303 which is the same form factor as the TB-303 and I love it. It’s been a good tool on the road this year. I am very (read that as VERY) curious about the TB-03. I’d love to get my hands on one and do a comparison and write up between the modern bass box devices. So flat and sloppy next to octatrack with exception of the tr09. Makes me wonder. I really just want a 909…..if only. I’m with you on the re release. And I really love the TB3 it’s so squelchy. @Dave Sklar – I appreciated the “tension” and the compression of the TR-09. I think this device plus the TB-03 would be endless pleasure. I love the TR-909, but it’s vintage and it’s huge and consider that it provides structure for our music, and not really character. This a smaller replica with capable sequencing and controls could be really really fun in a live situation. Samples are also fun (if they’re good) but often actually end up lacking real depth totally. I think one of these is just exactly what’s needed for the basics below the loops and bass lines and melody. Really dug the write up. Very interesting. I always struggled to understand why anyone would buy the tr-09 when the tr-8 has 909 AND 808 (and 707) expansion. Maybe sound is the reason after all. I could see owning a TR8 & TR-09. The TR8 can focus on 606/707/727/808 sounds, and the TR-09 can just do its thing. Best of both worlds. thanks for such a useful review, hope you are very well, big hug. Thanks, if anyone knows this machine it’s you! Scientific enough for me. Awesome read. Thanks! @L dawg – I wish I’d have been able to include the Drumbrute in my example here, but again, that’s not exactly a 909 replicant. 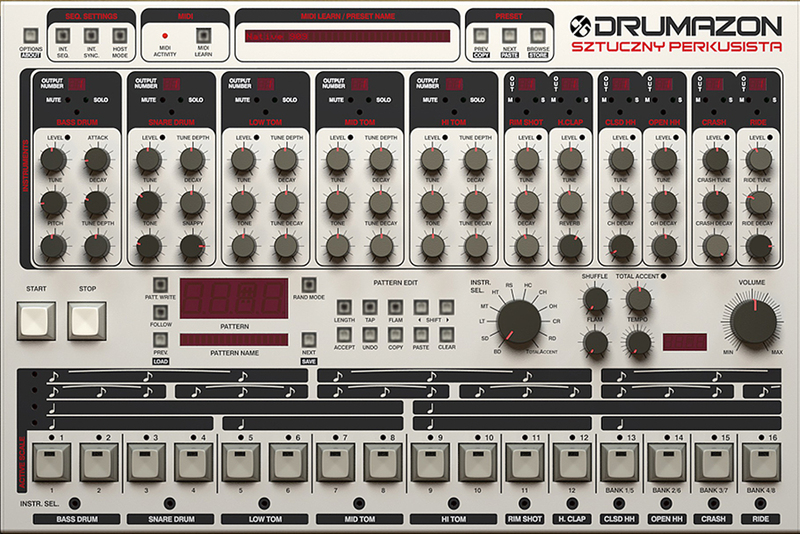 I haven’t been all that interested in how the Drumbrute sounds. I think I’ll have to get my hands on one and hear it in a system for myself. Just did a little side-by-side here with the TR-09 and my original TR-909… Wow, this little man, the TR-09 held it’s own. My 909 is clean and has that good old raw / warm feeling but the TR-09 sounds tasty to my ears. Interesting thing that I noticed. Both the new boutique and the original share a neat little effect… playing both the clap and the snare in unison creates a flange effect. I imagine this is due to the shared noise source used to create those drums. Well, it’s faithfully recreated in the TR-09 as well. Sonically they both responded similar to elaborate snare rolls, along with claps too. Midi velocity had better range with the boutique. Neat! @Sean Ober – Totally agree.